In this page you need to provide information about the email address(s) to whom you want to send the resultset(s). You can even CC: and BCC: the result(s) by providing the email addresses in the Cc: and Bcc: textbox. From Name: Specifies the friendly name associated with your e-mail address. When you send messages, this name appears in the From box of your outgoing messages. From Email: Specifies the e-mail address that people should use when sending e-mail to you at this account. The e-mail address must be in the format name@company—for example, someone@webyog.com. Reply Email: Specifies that you want replies to your outgoing messages sent to a different e-mail address, which you can type here. For example, you might send messages through one e-mail account—RNS@webyog.com—and specify that you want replies sent to RNSmith@msn.com. If you do not select this option, replies to your e-mail messages are sent to the e-mail account from which you send them. To Email, Cc, Bcc: In the To Mail, Cc or Bcc boxes, type the e-mail name of each recipient, separating names with a comma or a semicolon (;). 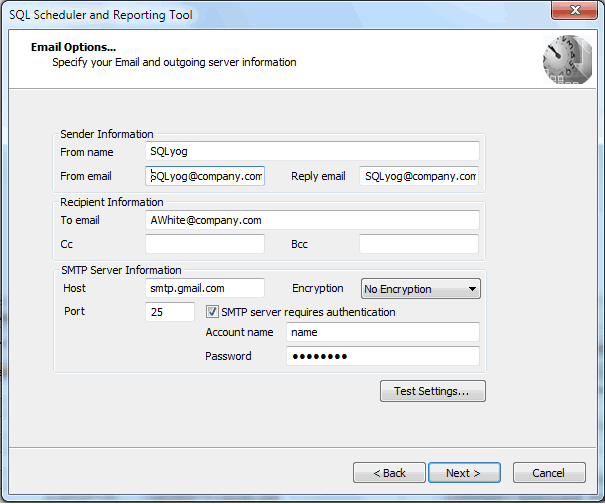 Host: Specifies your Simple Mail Transfer Protocol (SMTP) server for outgoing messages. You can get this information from your Internet service provider (ISP) or local area network (LAN) administrator. Type the SMTP server address. You can enter the host name, including domain, or the TCP/IP address. Example: Gmail SMTP address is "smtp.gmail.com". Encryption: Select the type of Encryption - SSL/TLS mail encryption which is now supported for mail alerts. Port: Specifies the port number you connect to on your outgoing e-mail (SMTP) server. This port number is usually 25. If your SMTP server requires authorization to send email then you need to check SMTP Server requires authentication and provide the details. You can get this information from your Internet service provider (ISP) or local area network (LAN) administrator. However, some internal SMTP servers may be setup on non-standard ports which will require that this field be changed to match the listening port of the mail exchanger. For example Gmail listens to port 465 for SSL encryption and 587 for TLS encryption. Username and Password: When sending mail through an authenticated SMTP server, you can fill in the User and Password fields appropriately. If you are not using a secure SMTP server, an error 5xx unrecognized command may be returned from the server if you enter anything into one of these fields. To test whether you have provided the details correctly or not, press Test Settings. SQLyog will send you a test mail and confirm the success.